Facebook is serious about online security and has launched “Facebook Anti-Virus Marketplace” to help users stay protected. 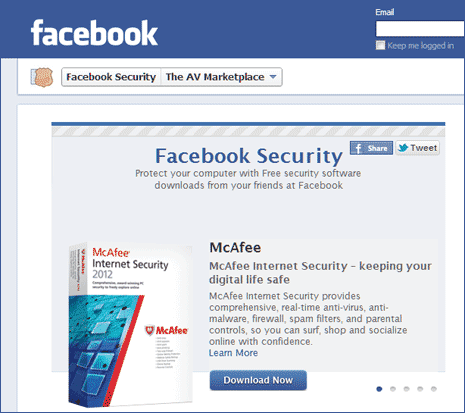 At Facebook AV Marketplace you can download full version of best Anti Virus software for free (with working licenses). Since top rated Anti Virus software is being offered with free subscription, this is good incentive for Facebook users to download and install anti-virus software for protection against online and offline threats. 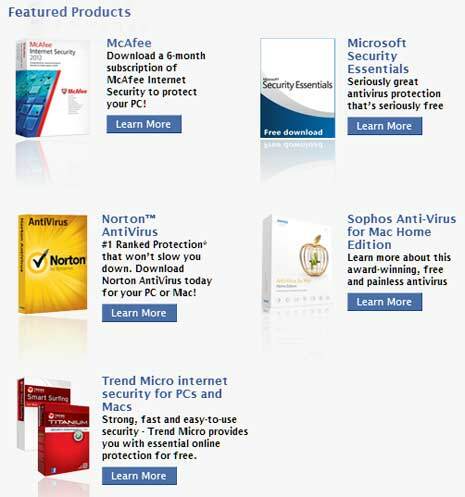 It is straight forward, just download any anti virus software listed at Facebook Anti-Virus Marketplace [on.fb.me/FBAVMarketplace] for Free. Software download comes with free 6 months license subscription (which means 6 months of free software and anti-virus definition updates). Only restriction, one anti-virus software download is permitted per Facebook account. So make sure you decide which anti-virus software is best for you as downloading multiple software per Facebook account is not allowed. 1. Microsoft Security Essential – It is completely Free anti-virus software solution from Microsoft. It helps protect your home and small business PC from viruses, spyware, and other malicious software for free. Only condition, your PC must run genuine Windows to install Microsoft Security Essentials. 2. McAfee Security software – You can download latest 2012 version of Mcafee security software with free 6 months subscription. This comprehensive security suite includes award winning anti-virus, anti-spyware, anti-spam, anti-phishing, identity and firewall protection. 3. Norton Antivirus – Another well known and popular anti virus software protection with free 6 months license. Norton anti-virus with unique Norton Safe Web for Facebook helps keep you and your friends safe online. 4. Trend Micro Security – Trend Micro internet security provides advanced protection for your PC or Mac. It helps safeguard against malware, viruses, spyware and dangerous websites. 5. Sophos Anti-virus – For Mac users, Sophos Anti-virus provide full protection from viruses, trojans and worms. It promises to stop all threats, even those designed for Windows.